Best Chinese Knives: Asymmetric Fixed Blade Clone Knife Review! Asymmetric Fixed Blade Clone Knife Review! After lots of folder reviews its fixed blade review time! I received this one about a month ago from AliExpress seller LDT. It arrived in a plain black cardboard box (wasn't damaged at all during shipping). The knife arrived without fit and finish flaws, pretty sharp (but not razor sharp), sheath also arrived in good condition without any immediate flaws. - The freaking awesome Alexey Konygin design. This is one of those knives, that are designed so perfectly, that it is great aesthetically, ergonomically, but also have an original design, three things that are very hard to combine in one knife. - The fit, finish and overall quality of the knife and a sheath. No issues at all, all the edges are smooth, the fit is exceptional, the grind and finish on the blade are amazing for the price. - The materials. The blade is made of D2 steel and has full tang construction. The handle is a sandwich of thin later of real 3D machined carbon fiber (not like the Ganzo stuff). glued to black G10 and then glued to white G10. I also liked the blue accents around the screws that the Chinese added to the original design. 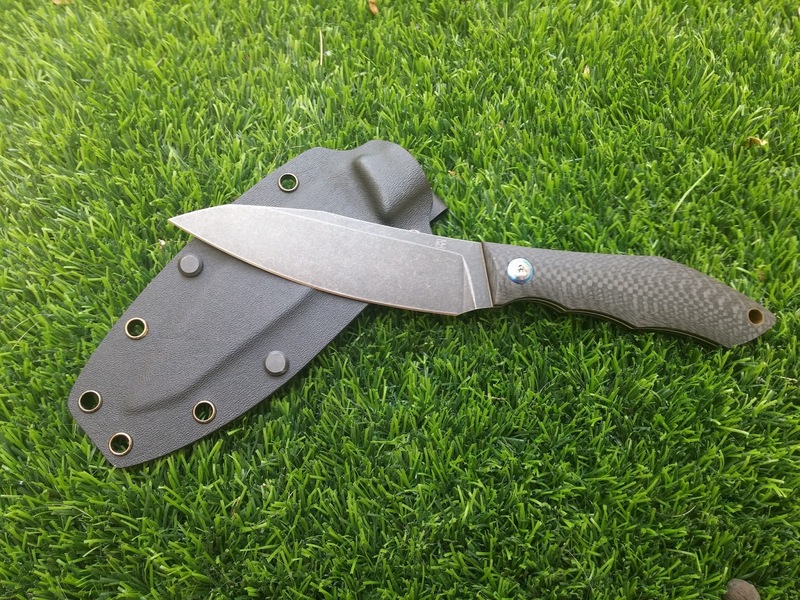 - Sheath is awesome, its made from 2 pieces of kydex (not folded) and made really well, including the kydex belt loop (I believe it could be easily replaced with a Tek-Lok). - The blade geometry is unique and also practical, especially for cutting on a board. - Ergonomics and balance are great. - Pretty low price for this quality and materials. 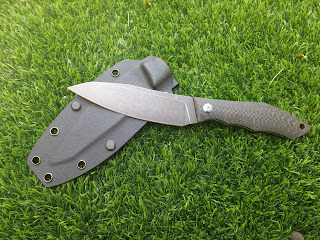 - As I've said, I really like the design of this knife, but if I could add something to it - it would be some gimping on the top of the blade to add a little more traction. - The knife didn't arrive razor sharp and it seems it was sharpened to a pretty steep angle. I mean it cuts good, but for it to cut great a little sharpening could be needed. - The ergos are close to perfect for my middle sized hand, but for people with XL sized hands this knife may be a little small. This knife is really exceptional in terms of design, quality, fit and finish, but the best part about it is that it is a real eye candy (I feel like it is almost too pretty to use), that will look great in the collection, pictures and videos. It will probably impress fellow knife lovers and non-knife people with its design and definitely one of the prettiest budget fixed blades out there (definitely prettier than a Mora). As a user, it could be great with light and medium cutting tasks, like it's intended purpose - outdoor kitchen knife but it's not intended to be taken to a war. I am really pleased with it, especially for the price. That knife is looking great, if I had any use for a fixed blade I'd maybe get one. Anyways, is it just me or why is there a "pivot" screw? I mean, there's a lanyard tube so I guess the handle is glued, so it the screw for the looks instead of a (mosaic) pin? Yeah, the handle is glued, but just like on the original they used a pin to strengthen the construction. I kinda like this solution, especially with the blue accent it looks even better IMO. You meantioned that the handle is made of "Real" Carbon Fiber and not like Ganzo's stuff! Isn't Ganzo CF Laminated CF (real one)? Thanks for your good reviews. You're right about the cf, it's indeed "real" and not to be considered "cheap" in a bad way. Spyderco is using the same laminate on some of their more expensive knives, the Chapparal is at least 6 times as expensive as your average Ganzo. If you don't like the shiny surface just sand it with a 600-800 grit sandpaper and it's getting classy, or you could just rub it with a scotchpad. The layer of CF that is used on this knife is much much thicker than the one that is used to create the laminate that Ganzo and now also Kershaw use for the scales (can be seen from the 3D machining of the handle). That is what I mean by "real" CF that is just being glued to the G10 and not a Ganzo laminate for show and a similar one is used by lots of companies, including Spyderco, Ontario and others. I'm not so sure if that G10/cf laminate is such a bad idea. Pure cf is quite brittle while G10 is much more forgiving on impact stress. That is exactly my problem with this thin CF laminate - because it's so thin you can't 3D machine it to make rounded handles like on this knife or flute it to provide more traction. For flat handles it's fine as long as the edges are done well. Where can we buy this knife? The link in the post does not seem to work.